Ah, the days seem to be passing more quickly now … it’s that whole acceleration to Christmas thing, you know? So it’s Day 22 of our event and we have Linda (The Gluten-Free Homemaker) hosting and sharing her Cinnamon Rolls. This recipe is a long-time favorite of Linda’s and her family. She converted it to dairy free last holiday season as she’s been eating dairy free as well as gluten free for over a year now. If you eat dairy, Linda says to go ahead and use cow’s milk, but she used almond milk. 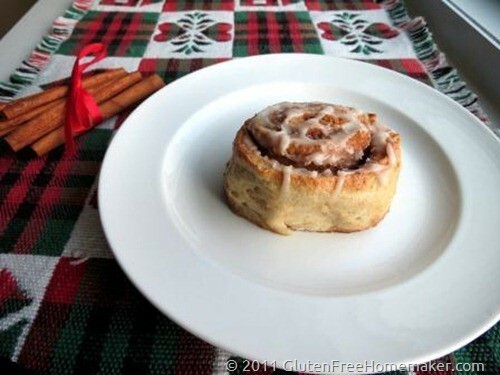 You can read the other details on making these Cinnamon Rolls over at Linda’s. Nothing about this recipe seems difficult, but everything about this recipe seems delicious! I’d been following Linda’s blog and her weekly blog carnival (now called Gluten-Free Wednesdays) for a few years when we both were invited to the General Mills Gluten-Free Bloggers’ Summit in November 2010. Looking back, getting to finally meet Linda in person was the best part of the event! Be sure to visit Linda’s site each week for her Gluten-Free Wednesday event, which features dozens of great gluten-free recipes from various bloggers (all gluten free, some also dairy free, some sugar free, etc.). In addition to many of her own wonderful recipes on non-Wednesdays, Linda also offers book (resource books and cookbooks) and product reviews with giveaways, and simple, but essential kitchen tips. 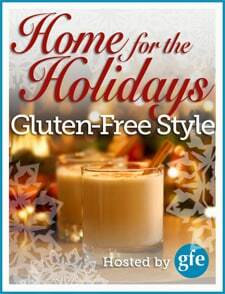 You’ll want to put The Gluten-Free Homemaker on your subscription or “visit often” list! Oh, and if you’d like to read Linda’s personal story on why she eats gluten free, you’ll find it here. 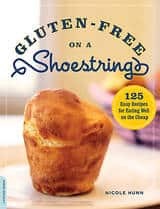 Gluten-Free on a Shoestring ~ This cookbook is Nicole Hunn’s popular, all-purpose cookbook that—as the title indicates—puts the emphasis on frugal. Faithful gfe readers know that I often state that living gluten free does not have to be more expensive than living gluten-full, so I’m behind the mission of Nicole’s cookbook. 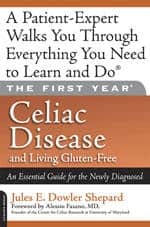 The First Year Celiac Disease and Living Gluten Free ~ As the cover states, “A Patient Expert Walks You Through Everything You Need to Learn and Do.” Jules Shepard (who I spoke about at length when referencing her Home for the Holidays post here) is one of our foremost gluten-free “patient experts” (having celiac herself) and advocates. Who better to walk you through the first year than Jules? 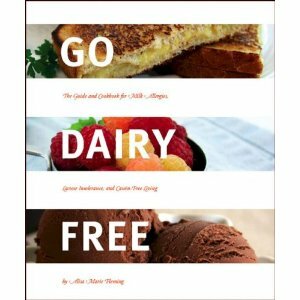 Go Dairy Free ~ It was only yesterday that I talked about Alisa Fleming (Go Dairy Free and Alisa Cooks) and her comprehensive book on going dairy free. Alisa does it all when it comes to dairy free living. She explains all the needed research/data, even the difficult scientific aspects, in layman’s terms. And she also makes fantastic dairy-free recipes. Case in point is the gluten-free, vegan Pumpkin Bread she shared with us yesterday. Gluten-free baking might be a new thing to her, but making her recipe meet all the requirements seemed like a breeze to Alisa. Linda’s giveaway ends Wednesday, December 19th, at 11:59 ET. Visit Linda’s blog to enter. We still have a few more days left … daily giveaways, special impromptu giveaways, and the final giveaways from Caveman Cookies (third prize—gift package of $89 value), Free From Gluten (second prize–$150 shopping spree), and the Vitamix Super Healthy Lifestyle package (grand prize with $550 value). Don’t miss a one … tomorrow we’ll see what Gluten-Free Gigi is sharing! Thanks for the amazing giveaway! I’m so excited that I won! These cinnamon rolls looks absolutely delicious. Can’t wait to go and get that recipe. Thanks for the great giveaways and information. Hi Susan–I believe they are totally delicious! Linda is a whiz with pastries and breads. 🙂 I’m so glad you are enjoying our holiday event! These cinnamon rolls look good. I love Linda from gluten free homemaker. I would love it if she could cook for me AND clean my house!